The 67th King of Panchokot dynasty.The son of Raja Harinarayan Singhdeo and grand son of famous Neelmoni Singh was born in 1881 and died in 1938. In spite of being instated to the throne in 1901, he had to wait till 1903, the Panchokot Raj was then under "Court of Words". ln 1912 he gained recognition from the Nawab of Murshidabad Wasif Ali Mirza and in 1921 the British Govt. 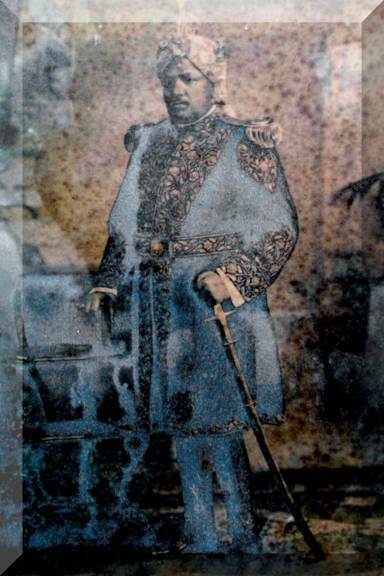 awarded him the title 'Raja Bahadur of' Kashipore which was then the capital of "Panchokot", but Jyotiprosad's various activities was not centralized within only his state-jurisdiction. 1. Under his patronage his chief priest Shri Rakhal Chandra Chakraborty wrote books like "Panchokot ltihas', "Jagaddeo", Rakhaler Gan", Kalyaneshwari Matar Shankha Poridhan" etc. 2. Apart from founding the 'Raj Rajeswari Temple' at Kashipore and the Kalimata Jyotiswar Shib Mondir" at holi place of Kashi, he also founded a printing press from where he published number of books. 4. In 1926 he founded the SARASWATA SAMAJ in Kashipore. lt was a cultural organization, involved with Classical Song, Yatra, Drama, Literary Works, educational activities. 5. He also built up a well stocked library with a multi-lingual collection of many books from India and abroad in his palace. 6. He paid proper attention to the traditional/folk literature and culture as well as modern theatre,modern music instruments as well as traditional Sanskrit education etc. a) He donated a sum of One Lakh Rupees for Purulia Sadar Hospitl. d) Ten Thousand rupees for St. John Ambulance working in the war-affected Arabian Countries. Apart from all this, he helped out draught stricken people as well as earthquake victims. His magnanimitay and contributions were in numerous other facets like schools, hospitals, orphanages, women's associations, founding of idols, retreat for leprosy patientss, setting up water facilities and communication systems.